Waldoch Farm Garden Center has a deep history in growing and selling fresh vegetables. Here's how they've become a go-to stop for many in Minnesota. Waldoch Farm Garden Center celebrated 100 years of business in 2016. Waldoch Farm has won the hearts of canners throughout Minnesota. We are a garden center and family-run farm specializing in uplifting spirits spring, summer and fall by using flowers, food and fun. We have offered fresh vegetables at our roadside stand since the 1920s and pick-your-own vegetables since the 1980s. People have come to us to supplement their backyard vegetable gardens with our own 35-acre garden of local, fresh vegetables. ￼￼￼These services are two of the farm’s heritage traditions that remain as the garden center became our primary focus. The vegetables can’t get much fresher when the customers pick them for themselves. Throughout the summer customers can shop for fresh produce, most of which is picked that morning. The summer vegetable stand traffic adds additional, welcomed traffic to our garden center. In the early 1970s, my grandfather, Dan Waldoch, built a greenhouse so he could start his own vegetable plants. At first, Grandma Lucille grew annuals in the greenhouse for her own garden, but this production quickly grew into its own business. Within two years they added another greenhouse, and this is when the business evolved to include fresh vegetables sold at farmers markets and an on-site roadside stand that also included garden plants, annuals and vegetable starts. Through the years, it made more sense to focus the time and energy on the customers willing to come to the farm, than cater to the farmers markets. Now we sell everything we produce, both flowers and food, from our farm location. Business is all in the family with mother Mary and sons Doug (left) and Andrew (right). As the local food movement grows, you cannot get food any closer to home than your own backyard. We take our food very seriously at Waldoch Farm. As a family of avid canners, we know what it takes to grow and preserve our own food. Through marketing and an online presence, we make our customer base aware of our extensive knowledge in growing food and food preservation. We want customers to know they too can grow their own food and we’d love to show them how. Customers use our experience as farmers to help them select the right varieties of vegetables for their gardens. We trial grow most of our vegetable varieties right on the farm. Our retail vegetable starts are grown from seed on site in the same conditions used for our transplants that get planted directly into our fields. We still use conventional fertilizer irrigation techniques, while using integrated pest management practices and we educate our customers about what that means. We go to great lengths to have our vegetable plants conditioned for direct transplant once they leave our stores. Roll-up sides on our greenhouses allow breeze conditioning, and nearby hay wagons serve as additional rolling bench space. We grow a wide variety of vegetable starts to make us an essential stop when deciding what to plant in our customers’ vegetable gardens. We make it known that we have the right tomato for anyone. To this end, the right tomato also includes the right container size. 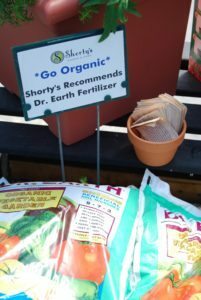 Our retail demographic includes families with space restrictions and others with 5-acre lots, so we cater to gardeners who plant respectively. We sell tomatoes in 4-packs, 1.04 pints, 0.96 gallons and 5-gallon Patio Ready Tomatoes setting fruit by Mother’s Day. There are tomatoes of all types: canners, Romas, slicers, cherry, grape and even more colors, shapes and sizes. With over 40 varieties from heirlooms to hybrids, there will hopefully be one to match every customer’s taste. The list evolves from year to year as we take stock of what was sold and if others are missing from the ranks. Peppers are seeded at Waldoch Farm Garden Center. We grow more than 19 different varieties of sweet peppers and more than 18 hot pepper varieties. There are bells of every color, heirloom varieties and special ethnic cultivars that have been requested over the years. Most of these varieties are also grown in our produce fields, which gives us a practical experience with each variety. When the peppers are in season you can come try them directly from our fields. Customers can use this experience to decide what to plant in their personal gardens the following year. At Waldoch Farm we have a wide variety of seeds, onion sets, seed potatoes and vegetable plants. Some of the additional started plants are: summer squash, pickling and slicing cucumbers, kohlrabi, kales, lettuces, Swiss chard, beets, cabbage, broccoli, eggplant, peas-in-a-pot, pole beans, melons, tomatillo and ground cherries, okra, winter squash and pumpkins. The difference fresh herbs can make is undeniable. At Waldoch Farm, customers are able to take their herb choices seriously with over 49 varieties, all of the classics, and a few unique varieties they didn’t even know they wanted. You can carry quite a few varieties of mint, but for some reason the one called “Mojito” outsells all the others. With our large selection of herbs ranging from Flat Leaf and Curled Parsley to five different varieties of Basil, there is a fresh herb plant for every themed dinner night. What is pesto without basil leaves freshly plucked from their own plants? Or cucumber salad without fresh dill leaves diced on top? Or bread without a bit of rosemary baked into the crust? Their herbal exploration will grow alongside the plants you sell for their herb gardens. We help our customers experience the fresh life. The team is transplanting peppers on their 35-acre garden. We’ve had fun with helping our customers get their veggies out of the ground and on to their decks or patios. Many people with limited space are turning to containers to grow their own food. We have pepper, eggplant and tomato varieties specific to container gardening, lettuce bowls that replenish themselves, and fresh herb gardens ready for harvesting within reach on the picnic table. Encouraging edible landscapes is a great way to add functionality into the beauty of your customers’ yards. By incorporating fruiting trees and shrubs, they can add a bit of flavor to their yard work. Trellis some grapes for shade and juice. Tell them to add raspberries to the sunny spot in their backyard and enjoy the fruits of their labor, literally. We carry a variety of perennial edibles: fruiting trees, apples, plums and cherries; and fruiting shrubs, blueberries, currants and gooseberries. As well as asparagus, raspberries, strawberries, rhubarb and grapes. From vegetable stand to retail garden center, edible gardening takes center stage. Our vegetable plant production is fluid from year to year, adjusting quantities and cultivars. Because we are a grower/retailer some of these modifications can be acted on immediately. We’ll seed more cilantro, basil or cucumbers if the product is moving faster than last year. Contrary to this, with other vegetables (like peppers and tomatoes), there can be a bit more urgency for the customers. They know when it’s out, it’s out. In Minnesota, our safe-to-plant date is Memorial Day; gardening before then has been known to be risky. But we will have customers shopping well before that to ensure they get the varieties they want. Others brave enough to gamble against the frost free date. This last year our Brussel sprouts sold out, which has never happened before. For those who missed out, they were instead directed toward our Kalettes, which were new last year. We like to experiment. For example, some new tomato varieties we only seed 18 plants the first time to see how we like them. Since we grow our own product sometimes it’s a little too easy to buy in another seed packet to try. Andrew Joyer is the fourth generation of family-owned Waldoch Farm. He can be reached at [email protected].